Description The airfield at Ambala. Hugh Gaitskell, a member of the government and later leader of the Labour Party, is visiting the RAF station. He is pictured with his hat in his hand about to get into one of the cars. 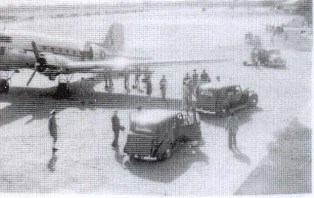 The plane in the photograph is a Douglas Dakota. 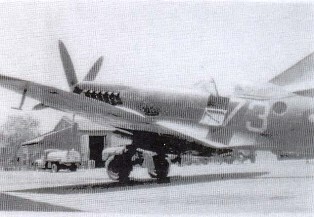 A Spitfire being refuelled on the airfield at Ambala. I was in the second intake at Hemel Hempstead Grammar School. I lived in South Hill Road at the time. I passed the scholarship from Bury Mill End School. There were 15 scholarship places for the whole Hemel Hempstead area each year and the other pupils paid to go to the school. I didn?t see much of a gap between the scholarship pupils and the others. I was very happy there. Discipline was strict but I was a good boy! I loved the sports facilities and played cricket and football. I was the captain of Salisbury House. My duties were mainly in the sports field and I occasionally read the lesson from the Bible at morning assembly. I would choose the teams and help organise sports day. My favourite subjects were maths and science. I got the maths prize for my year. The quality of teaching was first class. I left school at 16 in May 1937 and joined the Post Office. The first thing I did when war broke out in 1939 was join the Home Guard that was formed in Hemel Hempstead. We didn?t do a lot! We used to have weekly meetings and go out there and march up and down a lot. We did some firing practice. We weren?t well equipped but did get guns eventually. It was very much like ?Dads Army.? I put my name forward to join the RAF and started my training in 1941. I was 19 and they were generally calling people up at 20. My father was a little concerned, having suffered in the First World War. I volunteered to be a pilot in the RAF. America was not in the war at that time but they had volunteered to train pilots and I was one of those called over to Georgia for flying training. Our (UK) facilities for training were hard- pressed and couldn?t cope with the numbers who had to be trained to replace those who?d been killed. It seemed a good idea to have them trained in a safe place. Because they were still on a peacetime basis they set much higher standards than the RAF had and that was a bone of contention. It was a bit of a disaster. Out of a class of 90 they failed 50 odd for various reasons. I was one of them because I got airsick when spinning which was something the RAF trainees didn?t do. I always intended to be a bomber pilot not a fighter (so would have been unlikely to have been involved in spinning anyway). I was very disappointed. I was sent back via Canada to the UK and trained as a radar mechanic which I then was throughout the war. Radar was quite new in those days and it was a question of looking after equipment, mending it and setting it up for the radar stations in the UK. Radar operators used to man the machines all day long and mechanics were there if things went wrong, which they did. There was a fair bit of mechanical training and I was mostly in East Anglia which was where most of the stations were. The radar job was interesting but I would much rather have been flying planes. However, I know I was safer and I?m sure my parents were very relieved. You had no choice anyway. You had to do what they told you! They were short of people overseas and the Burma war was one of the outstanding centres so I got sent to India and then on to Burma where I remained until after the war finished. I was discharged in 1946. It was easy to work there in some ways because the local Indian staff tended to do all the manual jobs and it was much the same in Burma. So in some ways we were quite privileged. We didn?t see a lot of real action because the radar stations tended to be back a bit, not right on the front line. We didn?t know the intimate details of what was going on (on the front line) but we were aware of the horrors that some of our colleagues were going through, especially the army. We were very aware of the Burma railway and the way POWs were being treated. I thought the Japanese were dreadful at that time. I knew someone at school, Bob Bowers, who was a Prisoner of War in Japanese hands. He told a story of POWs being lined up and executed. The executioners were getting along the road towards him and then they suddenly stopped and he survived. But I didn?t have any direct contact with the Japanese. I stood the heat fairly well. It wasn?t much of a problem. I didn?t really enjoy my time there but I was aware that certain people in the family and around me were having a much worse time than I was. I was in the Far East for 3 years. That was the length of an overseas tour. We didn?t have any leave during that time and letters from home were terribly important. When I came back (to the UK) I went back in the Post Office with the intention of making the Civil Service my career. I was very lucky and got quite a lot of promotion and I finished up as Head of Personnel of the Driver and Vehicle Licensing Centre in Swansea. My first tour in Afghanistan was from April to October 2007. I was in B Suffolk Company, 1st Battalion Royal Anglian Regiment and I was platoon commander of 6th Platoon. A lot of people had been in the Army and been in Northern Ireland and never fired a shot and never been shot at and everyone essentially asks themselves, ?How am I going to react when I get shot at?? It?s a little bit ?sick? fascinating when everyone thinks, ?Wow, I?d like to have it happen to me just so I know?, and this seemed like the chance to find out. The training was not particularly brilliant when you look back on it so we deployed out there not quite knowing what to expect in Afghanistan. It was hot when we got there ? about 40 degrees during the day. I went out with the Royal Marines to the base at Fort Porag? Just outside the town of Gereshk. It was the first clearance of Sang and everybody had gone. The Taliban had gone, the local nationals had gone and there was no-one there so we drove in there pretty much unhindered. At night we parked up, built some defensive positions, sat there for three days and there were some bombs dropped but I think they were more in hope rather than in any actual confirmation of any enemy being there. And that kind of sums up what the attitude was in that we didn?t really think what we were doing. Then we came back and prepared for our first battle-group operation which was Op Silicon. And that was quite interesting because we?d all gone out there and been out on the ground patrolling, not knowing what it was like and then you hear gunfire and everyone?s really nervous and twitchy and you?re getting used to how you are going to manoeuvre in the green zone because it?s the first time you are there. Please can you explain what the ?green zone? is? The green zone is the area of vegetation and irrigated land inside of the River Helmand and it?s a mixture of compounds, mud-brick houses, walls, ditches ? quite deep ditches. It?s very difficult to manoeuvre in by anything other than foot and even on foot it takes a long time. It becomes very challenging and you end up having to move quite carefully through it. At the time we didn?t have to worry about IEDs (Improvised Explosive Devices), and we didn?t have to worry about where we were putting our feet. I spread my platoon out and realised that I couldn?t talk to anybody except for the section that I was with. I?d learnt all those tactics on the ground and nothing could have prepared you for actually being there, doing it, thinking if this had all gone wrong, I can?t even speak to that section. We advanced forward and then the other two platoons came under fire so we did what we?d done in training which was to advance forward to close with the enemy so we could get a position to counter them. But then all our tactics are based on the enemy being in positions that they?re not going to keep moving from and they?re set and dug in. We moved into a built-up area and there were two or three gunmen that were just popping up shooting at us and we tried to move out and got shot at and couldn?t move because 5 and 7 Platoon were being engaged on the road and they were firing out on both sides. You can?t move into fire so we were stuck in this compound. We did try to push out ?.. ?Let?s go,? flat-footed down the road, moving and breaking into a bombed compound. Kick the door in? on to the next compound. So, as we were about to do that, there was an almighty explosion on the back side of the compound and everyone got blown off their feet. There was dust everywhere and I remember thinking, ?Oh crap, not everyone is going to stand up ? we?ve taken casualties and what are going to do now?? ?Give me a head count, give me a head count, where is everyone?? And all of a sudden all of these people?s heads popped out of the dust cloud and people coughing and spluttering. ?Right we?re not going that way. So we threw a grenade to cover our extraction, popped back out, found my platoon sergeant who was on the other side, covering his nose, ?What happened, Boss, what happened?? ?It must have been an RPG (Rocket Propelled Grenade). It hit some of the rubble on the other side. Everyone?s fine but we?re not getting out of here; we?re going to fall back. What happened to your nose?? ?Well, I was on the other side of the wall and when the blast went off, it blew all the crap off the wall into my face.? So he had a cut on his nose and we were laughing about that and we came back in to this compound and the question, ?Are we going to move? Are we not going to move? And there was a lot of confusion on the net because the OC (Officer Commanding) was dealing with the fight he was in. So we ended up sitting there for about six hours. There was sporadic fire coming at us and guys would fire back and it really summed up being in the army. Being in a conflict is 95% boredom, sitting around waiting for stuff to happen, and 5% terror. ?Oh my God, this is going mad, what am I going to do?? And as a commander, the first time you see that, you really feel the pressure ? if I go that way someone could get killed. Ok, am I willing to take that risk or am I best off just sitting here? What am I trying to achieve? If someone gets injured going back there, on the hope I can link up with them and I don?t, then someone?s got injured and I?ve achieved nothing, then you really start to think, ?What am I trying to do and why am I doing it?? It?s risk verses reward ? very much so. Because in the Second World War it was ?we are fighting an enemy and we must take this ground?. Out there we weren?t going to hold this ground and if you don?t have to take the risk, what?s the reward basically? So we stayed in this compound for quite a time and we started to run out of water and we weren?t going to drink water from the local wells which were poisoned. It?ll make you sick and we all started to run out of water. One of the guys went down with heat exhaustion, body popping and eyes out of the back of his head. We pulled him down and took more water and he recovered and we were on the net talking to the doctor and that was the only way we could coordinate. We couldn?t casevac him out because we couldn?t afford a helicopter and we couldn?t move him down to other vehicles so we had to treat him on the ground. We?d got no back up and you have to get on with it. We just started to drink the well water from the pump that was in the compound and it was really cold and nice and didn?t taste of chemicals and that gave a benefit to the rest of the tour, realising that we could drink out of the wells which reduced the amount of weight we had to carry. The private soldier recovered fine and this was one of the good things we learned ? a lot of the training, a lot of the fuss made about PE (Practical Exercise) injuries, you?re off for six months ? but actually out there you just have to crack on with it. It?s a wonderful thing; they heal themselves and get on with it. Eventually we did get out of the compound again because the Taliban got hit by a couple of 500 pound bombs and they extracted back. We moved up to a ditch by the side of a road where we made a check point and sat there and spent the night just sitting and sleeping by the side of the road till morning and then moved on to the next phase of the operation. Captain Simon Broomfield - To a large degree, our TR7 tour was a series of quite big ops with a definite individual end-state to be achieved for each operation whereas from October and through back in March our routine, day-to-day, was much more focused on my little area. We had our initial patrol base and we probably wouldn?t patrol more than four kilometres from it. We were up against an enemy that was trying to melt into the population. And also the considerations for us were, if we walk over people?s fields, because we don?t want to get hit by an IED, that?s going to ruin their crop and not all of them grow poppies. It?s a large thing and to be honest they do sell it (heroin) in towns most of the time but that?s the only way they can make money. They?ve been told to grow that crop and they have to do it. So we try to placate them and give them the best opportunity to at least survive and make a bit of money so we try to avoid their fields wherever possible. Obviously, if we ever felt under threat we?d walk in a field and they?d come in and we?d give them a bit of cash for it if we destroyed any crop. We were trying to give a presence on the ground and our job essentially was to patrol but we were always expecting to get shot at, always expecting a device to go off. I would do a lot of sit downs with my chaps with the locals just speaking to them for 5 or 10 minutes chatting to locals or farmers. If we knew who a key leader was in the area, chat to him, find out information that way, build up that whole relationship that if you?re bouncing around places doing a big op you can?t really get. DAVID - But, one, they didn?t want to talk to us because they were scared of what happens with reprisals. And, two, we didn?t have that much we could offer them because we would be moving out again and a lot of the time they would just leave. We would rock up in an area and all the population would stream out in all different directions and let you know you were going to have a fight so it was quite surreal. You?d spark up, watch the locals leave ? everyone happy, the locals have all left? ? off we go then - and then we?d go in and have our fight and wait up to see if any of the locals come back and try to talk to some of them. The locals would come in again and along with them probably the Taliban. We realised we had to hold ground and the problem with holding ground is that it takes a huge number of troops. It limits the amount of influence. From being under control, or we thought control, of a massive area, including Ghanish, Nawar and areas we?d visit once every month, eventually we went down to having a company billet controlling an area maybe 500 metres to 2 kilometres of wall around itself. Suddenly you?ve lost influence over so much of Afghanistan. You just can?t go there. SIMON - Holding ground is incredibly difficult and the ground itself was so complex and the compounds so illogically organized that unless you had blokes everywhere you just couldn?t do it ? even the Americans haven?t got enough manpower. Because the Taliban are not as numerous as they were in previous tours, they?re trying to fight us with IEDs rather than with weapons. A lot of them have got metal in them so we carry metal detectors and stuff which stops radio-controlled devices and things like that which are very heavy so blokes are carrying between 80 to maybe 120 pounds and that?s a hell of a lot of weight, especially for someone who may weigh only about 140 pounds. So you patrol quite slowly ? you may only go 8Ks on a patrol and it will take you up to 10 hours or something. If you get in a fire fight you may only go 3 kilometres and be out for 10 hours. It can be frustrating ? when you do it on Salisbury Plain ? it?s a bit like play but on a more technical scale. If someone gets shot ? ?You?ve had your leg blown off? ? and the guys are like ?Cheers ? that?s me out for the next day?. In that situation, they won?t be a part any more so they just want to go to sleep in a wagon or something. But when you?re out there and you think, ?I?ve got these choices ? if that?s not going to absolutely help 100% what I want to achieve and I lose a bloke doing it I won?t be able to live with myself really. Can I justify that to myself? Or his parents?? The MOD has re-created an Afghan village in Thetford which is used for training. When we went in it was full of Afghans and they?d dressed it up so the villages looked exactly like an Afghan village and because we were hurried through the pre-deployment training, we were very clear in our heads that we had to take this seriously from day one. The first time we went out we?d not had the chance, due to time restraints, to patrol even as a section so the guys weren?t 100% sure what noise meant what. By the end of the tour we were walking at normal walking pace because the guys knew exactly what each noise means and they were happy that things move better when you move a bit quicker and you understand your own area. DAVID - You know they?re clever about where they put their devices. They?ll put them where they know you have to walk or they know a vehicle has to go and there?s no alternative route and you?re looking for ground signs so you can see if anything?s been buried or anything?s been changed. If you get hit by an IED where are you going to extract from? If they?re shooting, where are you going to move to cover? If they put the IED on top of that wall, it?s going to get you as well. They?re very, very good at appreciating ground, knowing where we can and can?t see and they put IEDs in at night or in areas of dead ground and know that we have to clear them and we have to keep going back. SIMON - The EOD teams out there (Explosive Ordnance Disposal Teams) do a fantastic job but there?s never enough of them to get in there and get every IED. DAVID - They are getting hit and it?s probably the highest risk job. The average casualty figure for a battle group is 20% so about a fifth of the people will expect to get injured in some form although this could be anything from falling off a vehicle to losing a leg. But the EOD guys are working at 50% - half of them are being injured. As soon as you walk out of a patrol base ? you leave at half two in the morning when it?s pitch black and they won?t be able to see us and our chaps carry something which enables us to hear what the Taliban are saying on their little radios. At first light they?ll be able to see us?. And within five minutes they know ? Yes, they?re leaving now. It?s not worth trying to hide yourself. Get a bit of cover ? they know roughly where you are if you can get a good bit of cover it?s fine but, conversely, they might put an IED in it. SIMON - It?s just understanding that operations out there now are very time-consuming and very slow. You?d rather take five hours to move a kilometre and have everyone there. It just comes down to taking it piece by piece. You can?t move on from somewhere until you?ve set the conditions for it to look after itself. It?s secure now and we?ll move on to the next bit. Do the Taliban have the advantage because they know the ground? I was thinking of Vietnam. DAVID - It?s different from the Vietnam War in that there?s no centralized government you?re fighting against. You have an armed force that has a political doctrine of fighting a long war but a lot of the Taliban don?t know what they want to achieve other than killing infidels, killing members of ISAF (International Security Assistance Force). They say they want to make us leave Afghanistan but it?s not as focused, not as directed as the Vietcong were and the North Vietnamese. It?s a different kind of counter insurgency. The way that they fight is tactically very similar, and may be operationally because they want to use the press but strategically they?re fighting for global jihad and global spread of Islam and Afghanistan is their chosen battle ground. They?re not fighting to win back Afghanistan per se. They start in Afghanistan because they want all the foreigners out. They want to have that insidious control over it and they?re not that fussed about having the responsibility of running the actual country. For some people, I suppose, they hate westerners and just like to do it. You can?t group them all together. It?s not a party line from the top that everyone abides by. People have different motivations. It doesn?t seem like Vietnam, a politically motivated government with a set regime of taking over that country and imposing a communist structure on it. They are fighting for militant Islam, for spreading of Shiah law but not this man is our leader, we will impose our control over the land, this is our cabinet. Are we, to an extent, trying to impose our culture on them? SIMON - Where we were, we walked around, spoke very few words of the language ? seven or eight - we were there to speak to the locals, help them to understand that they could trust us and we were there to help them and make their area safe and it was down to the government that comes in once we?ve done our job to how they lived, what their culture should be, whether there be schools. That was their decision to make. We were there to fight for security ? a school or a hospital hasn?t got as much kudos if the military has set it up. Some people won?t agree that ISAF should be there so that school becomes a target, whereas if the government had done it then it?s got far more legitimacy. On my level, on the ground with the locals, we were just there trying to be cheerful people for them, making life a bit safer and making it a bit more secure. The government decides how they run culturally after that. DAVID - A lot of the policies are difficult for us to discuss because it keeps changing. Things like schools ? they did try building schools and getting teachers organized. There was an army school we opened up ? hooray for us ? then we go away and come back. Teachers are all killed, pupils are all killed. It?s self-defeating; it needs to be set up by the Afghans. That?s the key to embedded partnering. We set the conditions and they do the re-building. They do it and we are just there to help and support them with the security that we can bring. SIMON - Partnering as well means that if we decide a compound needs to be searched, the ANA (Afghan National Army) soldiers would do it and I?d just go in, in the background. They?d organize the families so culturally ISAF has done nothing ? we?ve not inconvenienced the families, Afghans have done the search. If it was a fire fight situation to clear the compounds, that would be very different. The Afghans are very brave at times but if they see one of their friends get hurt or killed, all of a sudden all wind from their sails disappears so you have to be the people that grab them and tell them that they have to keep on going?.If I wanted information from locals, I would go with my interpreter and do it myself. But the fact that they can have a laugh and a joke with the locals and speak the language, rather than having the message relayed through an interpreter, it means a lot and hopefully they?ll learn from us and we also learn things from them. The two of us together work a lot better than just Afghan forces. DAVID - You have to understand how they work. They?ve been out there four years - and we?re here for six months. If they don?t want to go out on patrol they won?t. They set the pattern. You say ? ?That doesn?t make any sense to me as a westerner? ? but you just have to go with it. You?ve got to sell them the idea ? they will say, ?Why should I do what he says?? The other thing is we carry a lot of kit ? body armour, helmet, water, a bit of food, night vision, our radios, all this sort of stuff. We carry that stuff even if we expect only to be out for two hours and we leave early in the morning whereas, when we go out on patrols with the ANA, we get to half eleven and they?ll say we need our lunch now. They carry a rifle and body armour, probably not a helmet ? though they started to after a few IEDs went off among them. They carry a minimum. They don?t even carry water ? if they need some, they?ll drink from a well. They?ll go and have some lunch and then meet with us afterwards. Their way of operating is very different to ours. It?s easy for us to go out for six months and then come back to England and chill out for four weeks. A bit of leave and then six months off before training begins again. They don?t get this ? a new unit comes out and they don?t get the rest period. It?s a matter of adapting to their culture. Often they will achieve more by doing less. SIMON - That knowledge of the population and them knowing you is fundamental. That whole idea of making sure they were aware of what ISAF is and that we are there for them, that we?re not going to leave them in the lurch and hopefully, if we spread that message wide enough, they would side with us and understand that we were there to make their lives better and not to impose things like drink coke out of a vending machine. If you leave after six months do you form a real relationship with the villages and do they trust you? I still remember the faces of the locals ? although haven?t a clue what they were saying. There was a guy that, every time I walked past him ? he was a mechanic, he could fix anything ? I?d stop for two or three minutes with him. I?d have a laugh with him; he might bring out a cup of tea. We?d just have a chat. Once you?ve got to that point where you can sit and have a laugh. A lot of the time, I?d take my helmet off and take my radio head-set off if I felt safe to do so. Who are you going to be more responsive to ? someone sitting there with his safety glasses on, his helmet or someone who can be trusted? It?s fundamental to get cultural awareness right. You might think you?re trying to help someone but if you humiliate him in front of his family or his peers, until you get someone new in, he will give you nothing. That cultural awareness which they teach you at Thetford, that is critical. What about the equipment you use? SIMON - At first guys wore T-shirts under their body armour, whereas now everyone wears gloves and long sleeves. It?s absolutely proven. A guy in our company lost both his legs but having worn sleeves and gloves this will without doubt save his fingers. When I was wounded, if I hadn?t had the goggles on, it could have been a lot worse. This reduces the whole risk of these injuries and everyone?s become more aware ? the helmet?s there for a purpose and without a shadow of a doubt, the kit for an individual soldier is brilliant out there. You get enough stuff so you can actually move and do everything you need to do as a soldier or you just want to be able to operate. When you were injured, where were you? SIMON - We were in a village about 12ks north of our patrol base. We got helicoptered in there to go into a compound. Again, we paid the locals compensation and chatted and it was perfectly friendly. We had some ANA with us so there was this Afghan face with it all. What we were trying to achieve was a bit of a presence ? get the ISAF presence a bit wider and shake the Taliban up a bit. It?s just one of those things. If you stay there for two years most people would get an injury of some sort. That operation where I got injured and the guys that got killed ? we could have done nothing better and nothing different. We?ve just got to accept the fact that if they can hide in ground where it?s sandy, it?s rocky? it?s easy to hide stuff. You?ve got to accept that that?s the risk you take every time you go out on patrol and you?re minimising those risks every step. But sometimes someone?s going to get hit at some point. And someone radios for a helicopter? Yes, the American system?s incredible. The guys were treated on the ground and a medic came and carried on my treatment. Within 35 minutes I was on a Chinook helicopter. If needed they can take a guy?s leg off or they can do stuff that will save a leg on the helicopter. Then I landed at Bastion and was literally whisked straight into an operating theatre. David was there when I came round. Within 36 hours of injury I was being wheeled into Selly Oak and ended up there for seven weeks. You get every sense of support. DAVID - Medical planning drives everything. Unless you?ve got the medical cover, people will think about how they?re going to do a casevac. When you go on patrol, every platoon leader is thinking about how would you evacuate casualties. It takes eight people to evacuate that person because of the kit they carry on the stretcher. To carry him 600 metres, people are going to be absolutely exhausted and they?ve got to change over. So to extract one person takes a platoon. You?ve got to have protection; you?ve got to have the team to change round the stretcher. You?ve then got to secure the HLS (Helicopter Landing Site), clear it for IEDs before the helicopter comes in, you?ve got to protect the helicopter and it becomes so important and it?s rehearsed and rehearsed and rehearsed. The way they do it is a very set format. Training really does kick in so you don?t miss information about whether they?re male or female, what sort of injury it is, their breathing rates, all that sort of thing. There are two sorts of helicopters. There are the Blackhawks which will put on tourniquets and get you back as quickly as possible. They can pick up four people maximum and there are the fully prepared medical teams which can prep you ready for theatre. But the issue is the dust ? people don?t realise how dusty everything is in Afghanistan. You spend your whole time covered in it. It crunches in your teeth, it gets in your hair and it?s not just mud, it?s also crap, including human faeces. When the blast injuries occur it gets into the blood stream ? it?s what stops wounds healing. It literally stops your blood clotting ? it?s the biggest risk. SIMON - If my platoon sergeant says, ?I?m not confident about dealing with a casualty,? I?ll go to my company commander and say we can?t do this. He?ll say if you can?t extract casualties, then don?t do stuff. You can?t expect the blokes to risk their lives unless you can help them out if they do get injured. Before our talk, I thought the war was a very negative thing?but you?ve put more of a positive view ? that we?re there to help other people. Do you find when you come back that everyone is quite negative? DAVID - When I came back from Iraq in 2005, I got off the bus and that was it. Now there?s so much more awareness of Afghanistan and the casualties and the public perception has really changed. The way you are treated now in the military is very different. Now if you go out in uniform, people come up and shake your hand. We have the Freedom Parades ? people in the towns want to support us. We?ve just done one in Southend ? we must have had 7000 people on the streets. You wouldn?t have seen that beforehand. It?s also helped with the recruiting in the army. People want to be there ? people want to go to Afghanistan. SIMON - People feel they should give you sympathy. I don?t feel I need or particularly deserve sympathy as I was aware of the risks to myself and my soldiers when I went out there. I got off quite lucky really ? most people come back without an injury ? but out of injured people, I?ve not come off that badly at all. People think it must have been horrible out there ? but not at all ? bits of it were absolutely dire but bits of it were absolutely amazing. As an experience as a whole, that?s the strongest experience of my life. That initial tour that you do ? it?s the big one ? and it?s the one that will stick with me definitely. DAVID - One of the reasons people get back and people are quiet or thoughtful is because they?re actually a bit bereft ? they miss that sense of being part of something larger ? a Band of Brothers. Where we were, 6 Platoon was our world. It was brilliant to be part of that organization and to work with those people, to know people that well. Even if you?re in a ditch, up to your waist in water with bullets whizzing round your ears, someone will make you laugh. At the end of it, you?re exhilarated. It?s the biggest adrenaline rush in the world. I wouldn?t say you?re frightened because you?re too busy thinking about what?s going on around. People go out knowing that they could be at risk because it?s that professional challenge, you?re thinking about the problem ? how am I going to solve it. So you go out on patrol and you?re solving that problem and you?re thinking about this and your brain is going a hundred miles an hour and one of the weird things was in 2007 I had five casualties in my platoon ? none of them were killed but some were badly injured ? and that was one of the worst parts of the tour ? evacuating them, going to the casualty evacuation chain, dealing with all their kit, seeing the injuries they had. Then they got on the helicopter and they vanish from your collective consciousness because although you hope they are all right, you don?t have time to think any more than that. Your brain just moves on to the next problem. It?s not until you get back to Britain you find your ability to process the information, I?ve got these people here to focus on. SIMON - There?s a saying that there?s no greater feeling in life than to be shot at without result and it?s so true and a big part of it is that it won?t happen to me. Statistically, everyone who goes out there is more likely to come back uninjured than they are to be injured. You just think it won?t happen to us. But if people get too het up about near misses then it?s not the job for them. There?s a lot of near misses. There was a soldier come back from our battalion who had a bullet pass literally through the back of his neck ? it missed the spine by 3mm. One platoon sergeant was shot in the face. It passed through his cheekbone and came out his neck. He was fine. Stringer had five bullet holes in his body armour which means the kit works. People are having lucky escapes every day. There?s a perfectly good reason why I didn?t get any more injured than I did and why I didn?t get any less. It?s just one of those things that happens to you. As long as you understand that and don?t get worked up about it, you?ll be all right. The photograph shows David and Simon (seated) with Helena and Samantha at The Hemel Hempstead School. Description What were your experiences of war like? I didn't see any action. We were in the zones. The ship never fired in anger. We were only patrolling - that's all we were doing. I was in the Fleet Air Arm. The ship I was on was HMS Venerable - an aircraft carrier- and we were doing sorties - just patrols. We never fired in anger at all. Would you have preferred to be fighting - in action? I joined the Navy in '43 when things were getting a little bit better. Can you tell us something about what life was like aboard an aircraft carrier? We had all the facilities. We had Chinese people on board and they did our washing and ironing and aircraft carriers were the only ships that had bakers aboard and we used to bake our own bread. We always had a destroyer with us and we used to supply them with bread and we had white bread. You civilians only had brown bread and wheat meal bread. Aboard an aircraft carrier it was more like a hotel really. The only thing was we didn't have beds - we had hammocks. We had a hammock every night and in the morning we had to lash it down and store it. Was it a friendly experience -did you get on with everyone on the ship? You had to be friendly. You were all ship mates. It didn't pay to get nasty with anyone - it was one big family. What kind of aircraft were on the ship and how did they operate? We had Seafires - they were fighters - we had Barracudas - they were torpedo carriers - we had American Corsairs. The majority of the pilots were Kiwis - New Zealanders - and Canadians as well. They were good. Me being a steward, I was looking after them. I was like a batman - an army batman. What did your duties consist of? I think I had three pilots to look after - lay their clothes out, make sure their room was clean and tidy, make their beds and, when they came into the wardroom, you took a menu and they told you what they wanted and then you went to the counter to get what they wanted and you took it to them. What were your thoughts about the enemy - what were your worries and fears? We didn't like to know that we had to kill someone but we knew it had to be done. We never had to fire in anger but we would have done it if it needed to be done. What amazes me now is that I was out in the Pacific fighting the Japanese and I'm driving a Japanese car. Doesn't make sense does it? In an aircraft carrier did you feel very vulnerable to submarines? Yes. We were. Although we never fired in anger, we were always at action stations when we were on patrol. When the Japanese surrendered we were at sea and we were going in to Sydney Harbour and we had the radio on and we could hear the people in Sydney all going mad. We thought we would get ashore and we didn't. They turned us round and we had to sail to Hong Kong because they thought the Japanese were going to shoot all the prisoners. We had to go up the Malayan Straits and that was all mined. We had minesweepers in front, sweeping, and the marines were on the flight deck popping the mines off and we were wearing our life jackets all the time. And when we went into Hong Kong we had a battalion of marines aboard and they went ashore and some of our sailors were trained to go ashore. There wasn't any trouble anyway. Did you prefer it to the Pacific? It was more or less the same. You were sweating all the time and if you can imagine what a steel ship is like - it's like a hot house all the time. We wore our shorts and nothing else. Did you never go on the mainland? Did you spend your entire time on the ship? The only time was when we got shore leave returning to Sydney. The chap that I palled up with had relations in Sydney. Do you have particularly fond memories of your time in the service? Not really. I was doing a job. We had a job to do and that was it. Did you feel a strong sense of duty to your country? That's why I volunteered because you were born in a country and you had to fight for your country. Was there a reason for volunteering for the Navy? I had a twin brother - he died a few years ago. He joined the Navy first and he was on HMS Ceylon. And my father said to me, "Why don't you join the Navy?" And you know what he said to me - he said, "I think you're yellow." I never thought of joining the forces - I was having a good time in civvy street. But when my father said that, I went straight to the recruiting office and joined. Seventeen and a half. I went in at seventeen and a half; I came out when I was twenty two so I went in as a lad and came out as a man. It was an experience anyway and I saw the world and it didn't cost me a penny. I joined the submarine depot ship and I thought - in Holy Loch where the Polaris submarines are - and it was quite nice up there but I thought this is not for me so I put in for a draft and I got drafted within six weeks and I got drafted to a squadron that was just forming up and I went to HMS Blackcat in Warrington - shore-based. We were formed up there and when they got everyone - that is all the ground staff - we moved to the Orkney Islands and it was winter and I've never seen snow like it. You know Nissan huts - well we went to bed one night and when we went to get out of the hut the next morning we were absolutely snowed in and we were there - we were supposed to be forming up training - for, I think, about two months and we couldn't do a thing. We had corned beef and biscuits dropped to us by aircraft because nothing could get into the Orkney Islands. Anyway, we got over that and we went to Scapa and picked up the aircraft carrier and then we did a few trials and we went from there to Gibraltar, then to Malta With an aircraft carrier, they always drop the aircrew and the aircraft ashore and they do a bit of training. We were in Malta for quite some time and then we left Malts and sailed for Ceylon and went to Tricomalee - that's a big naval base there and we were there for some time. Then we sailed from there to Sydney and that's where we stopped. We operated out of there all the time until the end of the war. I believe HMS Venerable was sold to the Argentines and I'm told she was used in the Falklands against us - or they were hoping to use it but they couldn't get out anyway. I'm told now that it's scrapped. It's like all the big ships now - they don't want to know do they? Do you have any more recollections of experiences on the aircraft carrier? There was one pilot - he was flying a Seafire - and he hit the deck and swung round. There were two blokes in a gun position - he went over and they lost their eyes. That's put down to an accident in training. We had another one when we were up in Scotland - they used to do dummy torpedo runs - they were concrete blocks and this particular pilot - it was a Barracuda and they had a pilot, an observer and a gunner- and this pilot and observer were the two officers I used to look after and I was very friendly with the gunner - and they went straight into the sea. I don't know what happened. And that was it. I have been up in an aircraft and landed on an aircraft carrier - I have had that experience. The Yankee carriers are like hotels and these two carriers that they're building, they're going to have everything on them like the Yanks. They'll have shops, cinemas and what have you. But what's the good of that when we haven't got any aircraft? I'm very against this government and this country at the moment because this country is in the same state we were in 1939. Anyone can walk in here and take it over. We wouldn't have a chance. All the troops that should be in this country are fighting in other countries. That's my opinion anyway. Anyone can walk into this country. We couldn't defend ourselves. I was only a youngster in 1939 - I'd just left school but we had nothing. The only army we had was the Terriers and they went into France - the British Expeditionary Force - and they got chucked out at Dunkirk. I think we were very, very lucky. And another thing is, "Are they still teaching History in schools?" You talk to some youngsters and they don't know about Dunkirk, they don't know about the Second World War, they don't know about the First World War which was going to be a war that would end wars. You've never had wars anyway but there's always somebody wants to come in and take over. I'm 86 now; if I go tomorrow, I've had a good time. John was very keen to join the navy. "I wanted to join the navy as a wireless operator. I waited very impatiently for my 16th birthday and went down to the recruiting office. They said, ?How old are you?? I said ?16?. They said, ?Come back when you?re 17.? A year later, back to the recruiting office. Intelligence test ? ?which of these pictures is an electric light bulb?? Full marks. Suitable for the wireless branch. I went back for a further medical after which they put me on a train for Gosport where I joined HMS St George which was a shore establishment. I spent the next 10 weeks learning how to salute officers and how to march in step. After ten weeks we were informed that we were to be drafted to the Royal Navy Signal School, Fort Southwick in Fareham. At last we were to become wireless operators. No chance! On arrival at Fort Southwick we were told that they didn?t have a class starting yet, so for the time being we would be working ship. However, for the first week we would be going to the RN Fire fighting School to be trained as fire fighters. At the end of that time they stuck us all in a lorry and we went to Fareham and the Royal Naval Signal School. I did a fortnight?s course on ship fire fighting and from then, on every duty watch, we were the ship?s fire fighting party." At last John started to learn his job. "We had to learn Morse code at 25 words per minute on a typewriter. You?d start off with a pencil but once you get above 12 words a minute you can?t really write at that speed so we all became touch typists. Then I got this foreign draft to the Far East, to the Hong Kong wireless station. Up till now I hadn?t actually done any wireless operating so I thought at last I?m going to be a wireless operator. It took 8 weeks to get there in those days by ship. When we got there they said, ?Oh, you?re going on a course on Advanced Field Training.? I thought, ?Course after course. When am I actually going to be a wireless operator? Anyway, we completed the course. It involved learning how to shoot with a pistol and rifle and more square bashing." The Korean war began soon after he arrived in the Far East. "At last I got into Hong Kong Wireless Station. During that time they sent a couple of ships up the Yangzi. One went to Nanking and one to Shanghai. Their job was the diplomatic wireless link between the embassies there. Anyway, the HMS Amethyst was sent up to Nanking. What they hadn?t reckoned with, was that the Chinese Red Army was moving south and had just reached the Yangzi as the Amethyst went up. The Chinese opened fire on it and it ran ashore and was stuck there for weeks. We were exchanging messages to and from the Amethyst. In the end she managed to break away and nipped away down river. There is a good film about this called the Yangzi Incident. People kept ?twitting? me saying I hadn?t got any sea time in and in the end I succumbed and asked about it and somebody said someone on the Admiral?s staff wants to come ashore; you can change places with him. It was still a shore job but what used to happen was that every now and again the Admiral would go to sea on the Belfast (the same ship that is now anchored near Tower Bridge on the Thames). We did 3 cruises with the Admiral ? one to Saigon, one to the Philippines and Borneo and one to Japan. We used to go to Japan in summer as Hong Kong is very hot and humid. In Saigon, I palled up with one of my best mates who happened to be my wife?s cousin and that?s how I met my wife. Whilst we were in Japan we got a message to say the Korean War had started. North Korean troops had crossed the 38th parallel. So they immediately cleared the decks and the Captain stood on the gun turret and addressed us all. He said, ?The joy ride is over.? We went to Okinawa where we joined up with the American fleet and from there went to Japan and then for the rest of the war we were patrolling up and down the coast. For most of this time I was not a wireless operator, I was a typist. The signals would come down from the bridge into our office and by that time, because of war time conditions, they were all enciphered. We de-coded them and typed them out. I rolled 20 copies off and distributed them to all the different staff offices. Working with the Americans was interesting. We were part of the American fleet. That was the first thing we discovered. The British navy had adopted the American wireless procedures during the (Second World) War. When we got to Korea we discovered that the Americans had changed it. They were copying radio broadcasts by teletype; we were still using audio Morse code, transcribed manually. We had to learn pretty quick what the procedure was. Most of our radio equipment at that time was of American manufacture. There was no doubt that the Americans were in charge but we didn?t see much of them. I think we felt a mixture of envy and respect. We had a joke: The American sailor says to the English sailor, ?What?s it like in the world?s second biggest navy?? English sailor replies, ?Alright. What?s it like in the world?s second best?? Once I got a message to take by hand to the American Admiral on the USS Philippine Sea. I got over to the Philippine Sea and they escorted me to the communication centre. There was a marine outside the door with a sub-machine-gun. Classified messages were put in an envelope that was stamped as classified and then that went inside another envelope that was unmarked. The Admiral gets the message out and starts to read and I?m standing next to him so he tries to hide it from me. I thought, ?I don?t know why you?re hiding it. I typed it!? The actual fighting took place some distance away. "As Admiral?s staff we used to hop from ship to ship ? from the Belfast to the Ladybird, Ladybird to the Triumph, Triumph to the Theseus and so on. Each of these was only about a fortnight?s cruise. The Ladybird was the command ship for the war. She was an old Chinese banana boat which they had kitted out with radio equipment. It never actually went anywhere. We fired guns a few times but I didn?t see anything. I was down below in the lower receiving room. However, just before the Inchon Landings the Belfast had notice that it was coming back to England for a re-fit. The Captain requested permission to go into Inchon Harbour and bombard it. Everybody shouted, ?Silly fool!? We saw the Korean army in the distance and fired 6 inch guns at them. In the navy you?re fighting at a distance. The Chinese used to blow bugles when they attacked. We found a British man who could play the bugle to distract them. Living conditions were good. We slept in hammocks which were very comfortable. The food was pretty good. That?s the first thing we noticed when we got back to England. We arrived at Devonport on 12th December, a cold wet, miserable day. A couple of us went ashore in the evening. We went to a restaurant for what we had been used to ? ?big eats!? Oh dear! Food rationing was still in force. The restaurant menu was: ?egg ad chips, bacon and chips, sausage and chips.? We made the best of it and settled for egg, sausage, bacon and chips. I was in Korea from about July to November and then I came home. I?m a member of the Korean Veteran?s Association and they do a visit to Korea every year. You go as a guest of the Korean government. I went with my wife and we had a wonderful time. Everywhere we went, soldiers presented arms to us. It made me feel like royalty." After service in the Far East John transferred to the Fisheries Protection Squadron. "I served on a little minesweeper in home waters and near Norway and Iceland. It is an international force, there to render assistance to the fishing vessels. We carried a doctor and a meteorologist. Every time we saw a trawler we would hail it and ask if it required any assistance. There was one where the first mate of one of the trawlers had gone down with appendicitis. We took him to Reykjavik where they packed him in ice to stop the appendix bursting and took him to hospital. All round Iceland you had to protect the British fleet from the Icelandic Protection boats which tended to do nasty things. We had a difference of opinion with Iceland. We said international waters was a 3 mile limit from the coast and the Icelanders said it was 12 miles. We used to eat fish everyday. We had a caterer and he was given so much every day to feed every man on the ship. If there was any money left over you could have a share out and if the money was short you had to have a whip round to make it up. On fishing protection you received extra rations ? one large tin of fruit between 3 men every day and tins of sardines and one or two other things. This was to make up because it was permanent night during the winter. Each time you hailed a ship they said, ?Would you like a barrel of fish?? We ate fried fish for breakfast, fish and chips for dinner, sardines on toast for tea and fried fish, mashed potatoes and peas for supper. We had that everyday except Sunday. As a result, our mess savings were huge. Would you believe, I still love fish." 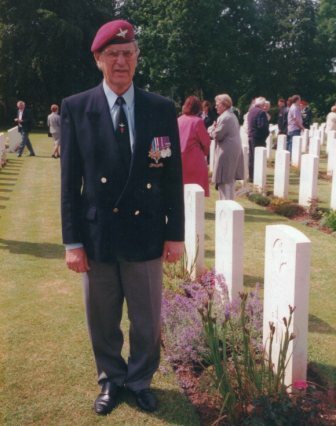 The photograph shows Norman Skeates at the Ranville War Cemetery on June 6th 2006. Mr Skeates volunteered to join the Parachute Regiment. When you volunteer for the Paras ? I volunteered in December ?44. So we did the December fitness test which was at Hardwick Hall in Lincolnshire. When you finished with it you was A1+. That means you finished with and different tests and route marches and everything to see whether you are fit enough for the route marches and everything so when you passed you go to Ringway which is an airport outside Manchester. You had to do eight jumps to qualify. That was three from a balloon ? that was a captive balloon ? that was two jumps and one night jump. That was war time so you had bonfires in different fields so you knew when you came down. As you came down with the chute you couldn?t see the ground because it comes up so dark. Anyway that was three from the captive balloon. Then you had five from a Dakota which was jumping through the door. When you jump out with the chute these lines break and the chute opens and then closes and then opens again and that?s the signal to pull your webbing down and you?ve got control of the silk canopy then and you put your legs together and as you hit the ground you twist together onto your side and that breaks and that?s equivalent to a fifteen foot jump ? fifteen foot from a wall. There?s quite a few people break their ankles doing it! After that I was stationed at Larkhill, a big military camp and I joined the 13th Battalion as an infantryman. I was there for about three weeks. Then the chaps went because they were going to drop over the Rhine on the last offensive up to the Ruhr and up to the Baltic. Being as I could drive a motor car or a lorry I was ordered on to the MT ? Motor Transport line ? so they took me out of the infantry and put me onto motor transport. So with the infantry dropping on the Rhine, transport had to be ready to re-supply them because when they dropped they only had limited ammunition. Having crossed the Channel we went by land to the DZ*. The six-tonners went to the other side of the Rhine and then we pushed ourselves up through the German lines with the Americans one side and us the other. After D-Day, Mr Skeates was part of the late 1944 operations in North West Germany. I was with the operation code named Varsity. That was the task of the Battalion ? to clear and hold ground. After we crossed the Rhine, I went up to Osnabruck. We went up to the Elbe. The instructions for the Brigade were to get up to the Baltic as fast as we could so we were in the fore there. Our orders were to push up to the Baltic because the Russians were pushing from the east; they were pushing towards Berlin which they reached. We thought they wanted occupation of Germany because they wanted the machinery of Germany in the Ruhr and everything ? the factories which, I believe after the war they stripped and shipped back to Russia. And our orders were to get up to the Baltic and occupy the land and we did it but myself, I got dysentery ? I must have had some dirty water or something. The Russians wanted to go further west and occupy Denmark so they could have an outlet to the Atlantic. So our Brigade Commander said they would send in the Typhoons which was our answer to tanks. The Typhoon was our most successful RAF anti-tank destroying aircraft. They swallowed and they stopped advancing. So that?s why the Russians didn?t take Denmark. We were mechanised then. There were several clashes. We were with the Armoured Brigade and on one side were the Americans. There was an engagement going on when I was there ? I was on the front line there. The 6th Airborne were going up and they were meeting young kids (the Germans were recruiting very young soldiers at this point). The Doctor and the Padre encountered German opposition ? an anti-tank gun ? it was manned by these youngsters. But luckily the Doctor and the Padre went forth and they talked them into surrender. The war ended as we met the Russians. As we went up three German generals surrendered to our Headquarters. They were retreating from the Russians. Mr Skeates was then transferred to the Far East. When the 6th Airborne came back they were going to drop on and invade Malaya and Singapore which was the Japanese High Command. We were then 5th Independent Brigade and we were going to drop on the Causeway (the road link between Singapore Island and the mainland) while the seaborne landing was going at sea just up the coast. The Causeway had to be taken and held because Singapore itself had a large number of Japanese units. What we had to do was to stop the Japanese coming out so we set sail from Bombay. They put us on a troop ship and changed our equipment from khaki to green for the jungle. I was doing a guard duty at the Raffles Hotel which was the Headquarters of the Japanese South-East Command and I had a few hours in hand and I went to see if I could find some watches and some pistols. I did find something. I saw a roughly made box. I opened it with my bayonet and there were shavings inside and soda things and they were uncut diamonds and I never realised it! As a young chap of only 19 I thought diamonds were things that glittered, polished! More than likely they were being packed up to go back with some general to Japan. We were in charge of Japanese prisoners. They were all in a camp but we took about 20 of them and had them doing different jobs, doing guard duty around houses and on the docks ? there was a lot of stuff that got looted. There was a black market. Then orders came to go to Batavia, Java. In Djakarta, the Dutch internees ? women and children - were trying to get to Batavia to get out of the country. The Indonesian nationalists were taking the Japanese arms and causing us trouble and they were killing the Dutch and the Japanese. So we had to go in there, making a strongpoint in a monastery and then we would go into the jungle and bring them out and ship them out so they could go back to civilisation. We had to leave there to come back to Singapore because the Dutch were coming back. The natives were literally crying to see us go. They didn?t want a return to Dutch colonialism. The 13th were the last out and as we went we heard a battle going on behind us. Then they told us we had to go to fight the communists in Siam (Thailand) but we never did. I got Malaria and when I went back to the East Yorks in June 1948 I was sent to the Millbank military hospital; then I was put in Richmond Park for rehabilitation. 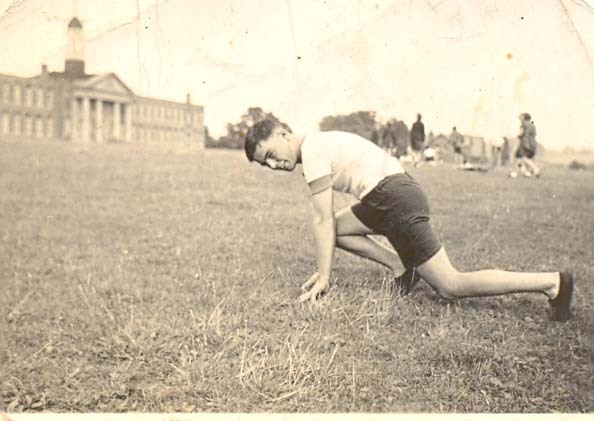 Then the camp was being prepared for the 1948 London Olympics and I volunteered for a PE display and that kept me going until I was demobbed. 'Varsity' - Over the Rhine; Germany to the Baltic. 'Zipper'- Far east seaboard landing in Malaya and Singapore. 'Pounce' - Singapore to Java, Batavia and Semarang. Tony left Hemel Hempstead Grammar School at the age of 16 and volunteered to join the navy. ?I went to every continent in the world except America. I didn?t really understand anything about life but I was so keen and wanted to see the world. I joined the navy under the ?Y? scheme. That was a fast track to becoming an officer. For most of the time whilst at the training base, I was a class leader, even though I was only 17 because I was the only one in my group who had any education beyond the age of 14 and mine stopped at 16. Some of the men I was in charge of were 35. Our instructor took me on one side one day and said, ?Have you any connections with the navy or the sea?? I said, ?No?. He said, ?Well, you know what they?re going to do with you; you?ll be a beach master?. So many young men he had instructed had been involved in invasions in North Africa and then Sicily and the Italian ones. The navy went in first, dropped those young midshipmen and they were the ones to get mown down. So, I thought about it. A chap I?d met on the train going down had decided to become a radio mechanic, and as I had the necessary qualifications (though only just)in maths and physics, I decided I would do the same. But I was pretty hopeless and failed the course after 2 months. So I went to sea as an ordinary seaman on a destroyer, mostly convoy work, steaming at the speed of the slowest ship.? Some time later Tony was transferred back on shore. ?I got taken off a ship because the Navy discovered that I had matriculated with distinctions in German, French and English. After D-day, they were taking so many prisoners they needed people to do interrogation of German prisoners of war (POWs. You didn?t need to be distinction level ? you were reading the questions and they demanded a single word answer. Depending on the answers you got from an individual he would go through that door and presumably end up in a POW camp or through the other door to be interrogated by Intelligence. Later, I was sent on a course to learn Japanese and eventually joined an aircraft carrier, but by the time we reached the Pacific and long before I was proficient in the alphabet, the atomic bomb was dropped and it was all over. When I?m talking to my grandchildren about their university careers, I tell them that the navy was my university, the University of Life. You saw the world and met so many new people.? An incident that happened whilst he was home on leave is still a vivid memory. ?A friend from the village (Kings Langley) was on leave at the same time and we were going to the Luxor or Princess cinema in Hemel Hempstead. When we got off the bus at the Plough there were a lot of people gathered round a man on a soap box. He was a member of the Communist Party and his theme was ?Start a Second Front Now? to help the Russians. The crowd was giving him a rough time and one man turned to us ? we were the only people there in uniform ? and said, ?Where are you two off to?? We said we were going to the cinema. He said, ?Well, you?re not going to pay today and you?re not going to stay here and listen to this rubbish? and he gave us a shilling each. Everyone was ever so patriotic. Tony was in Singapore a few days after it was liberated and the suffering he saw was a dreadful experience. His aircraft carrier then sailed to Australia where he was angered by the destruction of brand new planes that had been destined for Britain under the American ?Lend-Lease Scheme?. ?It was Christmas Day 1945 in Sydney and we took on board a host of brand new fighter aircraft and our Fleet Air Arm members would be armed with crow bars and would bash holes in the aircraft. We?d go 20 miles out of Sydney and ditch them in the sea. Florescent lights would come on the planes (the lights were there in case the planes had come down in the sea and the crew needed to be rescued). You could see these dots of lights all over the sea. For 4 months we ditched American made aircraft that were made under the Lend-Lease scheme and were brand new. Under the terms of the agreement they couldn?t be given back to the Americans or used in peacetime. We finally re-paid our war loan to the Americans in 2007.? This photo shows John and a friend in Port Said in 1945. I volunteered when I was 17 and went into the navy in November 1942. The reason I volunteered was that everyone was being conscripted into the army, navy or air force; well I thought it was my choice so I thought I would jump the gun and get in early. I wanted to go to sea and see the world, you know, but I was sent to a shore base, HMS Collingwood in Hampshire. I did my initial training there for 3 months and then I thought, ?Oh good, now for the big ships.? I joined the navy because I like my bed! We carried our beds around with us all the time ? a hammock! I didn?t want to sleep in ditches or under canvas. I was sea sick in the early days. In a small craft the boat is going up and down all the time and if you?re looking at the horizon it does make you feel queasy some of the time. You get over it in time. I was trained as a coxswain on board LCAs (Landing Craft Assault). We did landings in different places in England to practise for a couple of years ? Clacton, Poole in Dorset, The Isle of Wight, Hayling Island. It was different shorelines you had to get used to. We were on small craft ? LCAs. On board there was a coxswain, 2 seamen, 2 stokers and a gunner but we used to carry about 30 army men when we were making a landing. We didn?t know any details in advance (about the D-day landings). It was kept very, very secret. We knew it was going to happen but didn?t know the exact date until about 24 hours beforehand. In 1944, 6th June I went over to Normandy. I was on 503 Landing Craft. I landed on Juno beach with the Winnipeg Rifles at 8 o? clock in the morning, having left our sister ship at about 7 am. I was in the first wave. I was a bit nervous because I was steering the boat. You go in very slowly and as soon as you feel the bottom you start putting it into reverse and that holds you just long enough to drop the ramp and get them ashore. Juno beach was a very level straight beach; very sandy, but they had a lot of shore defences. There were lots of bangs. The navy was firing shells over our heads and there were big armaments on the beach head. We were fired on as we were going in. Even some of the bigger craft were turned over with the explosions and because they had mines on the beach. They had big ?scaffold? poles on the beach with mines attached, so if you touched one of these .....! The sea was very choppy so you had to be a bit careful. You didn?t want to end up on one of those scaffold poles. All I had was a .38 Colt revolver ? that was really small arms. I don?t think I would have been able to hit anything with it. We had a small Bren gun on the back of the LCA. The soldiers were all armed, however. The Canadians went in with fixed bayonets and knives. They meant business. It was marvellous when I looked around. There were thousands of ships, all shapes and sizes, the invasion fleet, it was. Amazing sight! We went back and got more people. I can?t remember how many times, but quite a few. It was a big responsibility. I was responsible for the lives of all the people on the craft and I was only 19. In Combined Operations we were the forerunners of the SBS (the Special Boat Service), the navy equivalent of the SAS. We took the beachhead and went into canvas tents. I was there until August. We had shelling every night from Le Harve landing on our tents and there were a lot of injuries from shrapnel. I was lucky. They had a roll of old merchant ships called the gooseberry harbour. Prior to having mulberry harbours they sunk merchant ships and made a temporary harbour for small craft such as us. We were billeted there for some time whilst we were taking supplies and such stuff ashore. I didn?t advance on into France because I was in the navy. I was glad about that. I was disappointed that I wasn?t on the big ships but I did get there eventually. In August we came back to the UK and picked up an LST* in November 1944. We commissioned it off the American navy and picked it up in Scotland. It had an LCT (Landing Craft Tank), the smaller tank carrying craft on our decks and we went out there to India, to Cochin, and they launched that off the side. They let the ship roll over onto its side and it just slid off. Then we went up to Rangoon in Burma taking supplies to the army and bringing back POWs and suchlike. This must have been about December 44. Then I went back to general service in the big ships. HMS Sussex was a First World War cruiser. We did bombardments down in Java and then went to Darwin in Australia. The Dutch East Indies were having a bit of trouble and we were helping them out. I always wanted to travel and Normandy wasn?t far enough for me. I think I preferred the Far East. Singapore was an experience. We had a kamikaze attack in the straits of Malaya. It was frightening but luckily he had unloaded all his bombs before he hit us so it was just structural damage he did. It was just on the port side. We had guns going to bring him down but he made a straight line for us. HMS Sussex was the first ship into Singapore harbour after the surrender (of the Japanese) and we did the guard of honour for Lord Mountbatten when he accepted the surrender and the keys (of Singapore) from the Japanese. The Japanese were still there when we got to Singapore. In fact we had quite a few Japanese POWs that we used to help load up different things (on the ships). There wasn?t much damage (in Singapore). We went ashore a few times but we were quite busy. We had to load the ship with things like LSTs. We took supplies up to Bangkok and such places. We didn?t have much to do with the civilian population. We were on the ship on our own more or less. I like hot weather so the heat didn?t bother me and you didn?t have to do anything too strenuous apart from painting the ship or something like that. We had films on the fo?c?stle (the front of the ship). We got chairs to sit out there and they put up a big screen. The food was pretty good. We had a hot breakfast in the morning ? tomatoes or beans on toast were common. The main meal was midday and we had tea in the evening, a couple of pieces of bread and butter with jam and a piece of cake and cups of tea. The Burma campaign was nasty. We didn?t have much to do with the actual fighting but we did do a landing at Rangoon. The fighting was going on further inland. We took some of the POWs who had been working on the Burma Railway. They were suffering from malaria, dysentery and other tropical diseases and starving. It made us feel angry and even a bit cruel to the Japanese POWs. When loading the ships they had planks up and we would put big bags of rice on their shoulders. Just for devilment we would jump on the planks and make them lose their balance ? just for spite you know. They were different altogether to us in those days. I think they were very uncivilised people. Whereas today they are civilised. It?s a different world now. We were in the Straits of Malaya when the A bombs were dropped on Hiroshima and Nagasaki. We heard it on the wireless and we all cheered. It brought the end of the war closer. I think the Japanese would have hung on for quite a while after without it. We were getting a bit fed up of being out there. It was months after the European war ended. I came back to England in 1945 and my port base was Portsmouth. I went into barracks there for about a year. During that time I was sent for training to take part in the big victory parade through London in July 1946. That was a great day! We marched from Hyde Park Corner down Oxford Street, through Trafalgar Square and up to the Mall. The crowds were cheering. I was demobbed in August 1946. I was 22. It (serving in the navy) was a good experience and it learnt me discipline which I think a lot of the youngsters could do with today. It was a good life for a young man. ** Men serving in the navy were entitled to a shot of rum every day.